The Trinity River Campus is located in the northwest corner of Belknap and Taylor streets in downtown Fort Worth, Texas. The recommended parking garage entrance is at the corner of Cherry Street and Belknap Street. The visitor entrance to the Riverfront Campus parking garage is located at Belknap and Cherry streets (see the red marker on the map or Click This Link). From Points North: Take Interstate 35W South. Exit 121 West (Belknap Street). Continue west on Belknap Street. The Trinity River Campus is located on the right side of the street at the corner of Belknap and Taylor streets. Continue to the traffic light at Cherry Street and turn right into the TCCD parking garage. From Points South: Take Interstate 35W North to the Spur 280 exit (Downtown). Continue west on 4th Street to Taylor Street. Turn right on Taylor Street. Turn left on Belknap Street. The Trinity River Campus is located on the right side of the street at the corner of Belknap and Taylor streets. Continue to the traffic light at Cherry Street and turn right into the TCCD parking garage. 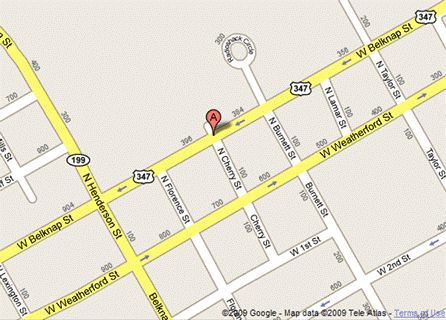 From Points East: Take Highway 121 West (Fort Worth) and continue west on Belknap Street. The Trinity River Campus is located on the right side of the street at the corner of Belknap and Taylor streets. Continue to the traffic light at Cherry Street and turn right into the TCCD parking garage. From Points West: Take Interstate 30 East. Exit Forest Park Boulevard and turn left. Stay on Forest Park until it ends in a sharp left term onto Weatherford Street. Turn left on Taylor Street. Turn left on Belknap Street. The Trinity River Campus is located on the right side of the street at the corner of Belknap and Taylor streets. Continue to the traffic light at Cherry Street and turn right into the TCCD parking garage.